Hendersonville Muffler Company will repair automotive clutch without spending a fortune. We repair clutches in cars and trucks here in Hendersonville, Tennessee every day. When you replace clutches as often as we do you can make the job look pretty straighforward. Replacing clutches is fairly straightforward for our technicians but we do see a lot of clutch jobs come into our shop that have been done VERY badly. 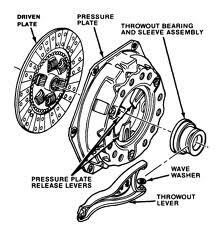 Most cars today are front wheel drive and removing the transmission to replace the clutch is more difficult than with rear wheel drive models. Many of the trucks in middle tennessee are four wheel drive and clutch replacement on these vehicles requires removing the transfer case. Early cars had large clutch assemblies like the one seen here that were fairly easy to get in and out. Modern cars are usually front wheel drive and you must lower a sub-frame assembly in order to remove and install them with special lifting and holding fixtures. We repair modern vehicles every day. Replacing the clutch in a vehicle is not hard. Not having the right equipment and proper holding fixtures and attempting to take out the transmission is stupid as well as dangerous. It's not just dangerous for your safety but modern automotive transmissions themselves are not getting any cheaper as technology gets added to them. Be safe and smart and have your clutch replaced at Hendersonville Muffler Company. We will perform your repairs quickly and carefully and give you back your car with the problem corrected and peace of mind. Hendersonville, Tennessee, (and most of Tennessee in general) is very hard on clutches because we have a lot of hills. However clutches in the city wear out more because of stop and go traffic. Still the dirt roads, gravel roads and all of the other obstacles like ditches, creeks, and little wooden bridges take a pretty hard toll on clutches here in Middle Tennessee. Automobile clutches, light truck clutches, rear differential clutches, hydraulic transmission clutches, even air conditioner clutches all provide the same service. They slip when it is required and grab traction when that is required. Early cars used cables and levers to actuate the clutch system. The bigger the clutch, the faster your left leg got bigger! As automakers changed their designs most clutches today are hydraulically actuated. Almost all cars and trucks use hydraulic clutch master cylinders and hydraulic clutch slave cylinders to actuate the clutch. We have been repairing clutches and related components here for many years. We are a trusted shop that does great work and we would be glad to service your clutch.